Frank Gronich’s extraordinary life story encompassed both devastation lows and exhilarating highs. Born a German – speaking Czech in the Sudetenland in 1932, he was subject to the Nazi invasion at the beginning of World War Two and the severe Russian occupation at war’s end. The Russians soon expelled the Sudeten Germans, and Frank and his family, with just one suitcase each, were deported to West Germany. There, separated from his home and loved ones, Frank worked, for just room and board, on a number of German farms. But he always dreamed of a better life and worked hard to educate himself. After winning a scholarship that enabled him to spend a year in the United States, he immigrated to Canada in 1952 and eventually arrived in Newfoundland and Labrador. In Corner Brook he and his wife Eileen established a thriving florist business. Then, in his forties, he followed a lifelong dream of becoming a lawyer. Again his persistence and drive paid off, and Frank rose to the position of Senior Crown Prosecutor. 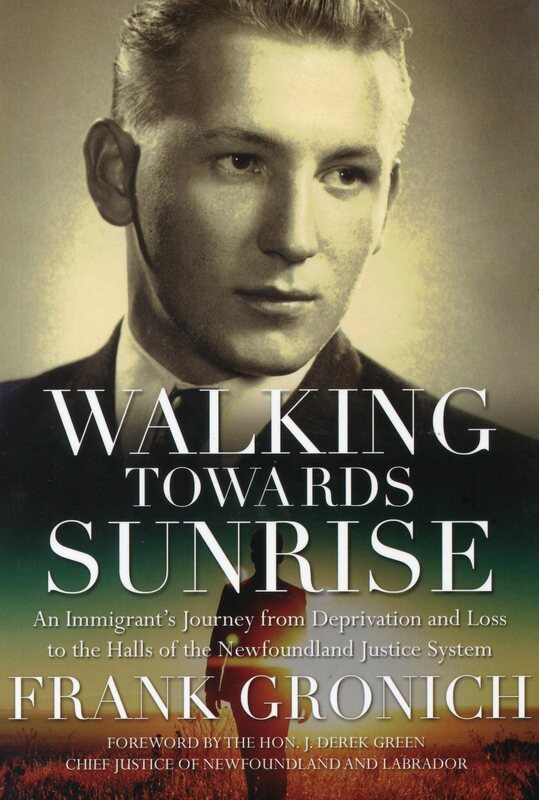 In Walking Towards Sunrise, Frank Gronich, with both humour and searing honesty, tell the unforgettable story of his journey from dispossession to fulfillment.